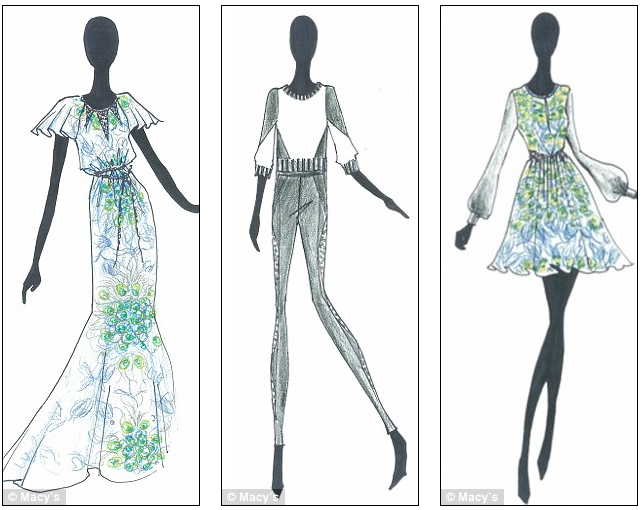 Macy's have revealed a selection of sketches from Nicole Richie's Impulse collection for Macy's. Nicole's designs feature in signature peacock print and billowy, feminine cuts. Macy's chief marketing officer Martine Reardon believes the star's limited-edition designs will sell out in under two weeks. 'Nicole is pretty savvy when it comes to the fashion business and understanding consumers. She’s a real fashion influencer,' she said. 'She’s got a very definitive look, very free style and bohemian chic, and our collection will definitely pay homage to her style. Nicole's collection is set to debut in September across 100 Macy's stores and online. Click Here to read more about Nicole Richie & Macy's collaboration. Wow, Amazing! I love that third sketch!